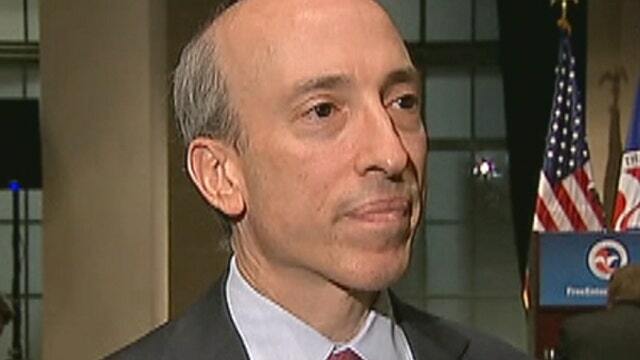 CFTC Chairman Gary Gensler on market transparency, banks, trading glitches and Libor. The nation’s top derivatives regulator said Friday his agency will not delay the next round of major trading reforms due to take effect next week despite concerns of some financial firms and their customers. In an interview with Fox Business, Gary Gensler, chairman of the Commodities Futures Trading Commission, said new regulations covering financial instruments known as “swaps” will take effect Wednesday as scheduled. Swaps are contracts based on an underlying asset such as a commodity or bond often used in “hedging” to protect owners from price swings. They can also be used to speculate. As a result, swaps can affect the costs of everyday consumer products such as gasoline or the interest on mortgages. According to regulators, the face value of outstanding swaps is currently more than $600 trillion. But before the financial crisis, they were largely unregulated. And so-called “credit default swaps” sold as insurance on financial instruments were blamed for bringing down insurance giant AIG, triggering a $180 billion government bailout. Dodd-Frank financial reforms approved by Congress in 2010 required investors and customers to begin trading many types of swaps on exchanges --“swap execution facilities”-- to provide buyers, sellers and regulators with more transparency and, in theory, to make transactions less risky. Now traders must register with the exchanges, which become operational on Wednesday. But some market participants worry the exchanges will not be ready and have said they may resort to negotiating swap contracts the old fashioned way -- by phone. Gensler said the CFTC will be flexible as the new trading platforms go live. “We will work with market participants where we find it appropriate to find some time limited relief on particular matters such as reporting,” he told Fox Business after speaking to the Chamber.